This new functionality complements the existing WIS capability for discovering GEOSS data and products via WIS. This capability is available at WMO’s Global Information and System Centres (GISCs – see www.wmo.int/giscs). In an interview with Scott Robinson, Director, Global Data Products at Pitney Bowes Business Insight, he talked about the company’s new Geosk search engine, which uses the location of the data itself to help reduce the sheer volume of the results and to rank the search results specifically to the needs of the user. GISVoice: How does the data search work? What types of keywords and results do users get? Scott Robinson: Search, discovery, and access of spatial content are the main objectives of Geosk. Keyword searches performed by customers in the Geosk Marketplace match up against the descriptions and metadata and records of the available listings. Users can search by keywords, like a content type (i.e. Streets), geography (i.e. San Francisco, a specific postcode), or other search facets including file format, data type, projection, data vendor, and customer rating. MapRank™ search technology is used to enhance and refine the search, ensuring that the most geographically relevant results are returned. GISVoice: What specific advantages are there to this type of data search as opposed to a browser or other applications? There are 2 specific advantages to this type of data search (which are part of platform services provided by WeoGeo). The first is in the search technology itself. Text-based search dominates the search world today and search results from a text-based query can be overwhelming for the user to review. That is why there is so much emphasis by search companies on “tuning” their algorithms to the interests of the user. The spatial data industry has an additional filter that can be used to fine-tune search results, which is the geographical location of the data set of interest. We use the location of the data itself to help reduce the sheer volume of the results and to rank the results specifically to the needs of the user. The second advantage comes from the accessibility of the data once the search is completed. If you find it on Geosk, you can have the data right now and in many cases, you can have as little or as much of it as you want. GISVoice: How does the cloud draw from the disparate databases that information is stored in? The information is actually stored in the cloud and has been indexed to optimize search efficiency. The information can be stored natively in one of many spatial data file formats, like MapInfo TAB, ESRI Shape, KML, CSV and many others. Once the user identifies the data they want, they can perform on demand transformations to the many file format types supported by the platform. GISVoice: Does the data search for data such as that used by Homeland Security or other government agencies, and how does that work if so? The data search is a function of what is accessible to the user using the platform. Publically available data sets that are hosted by Geosk are available to any user. Those data that are available on an access-controlled basis (where the access is controlled by the owner of the data) are only available to credentialed Users. GISVoice: What is the pricing structure for this solution? Geosk Marketplace offers data in 2 different ways. First, you can “buy by the drink” which is where you find, customize, and purchase data for immediate consumption. Second, you can buy an annual subscription to the data where you can get continuous access and customization services, as well as our maintenance of the data. Geosk Library is a hosted solution for managing an organization’s spatial data assets. This offering is a monthly fee for hosting and management of content that is based on size of the data stored, and the number of users accessing the content. 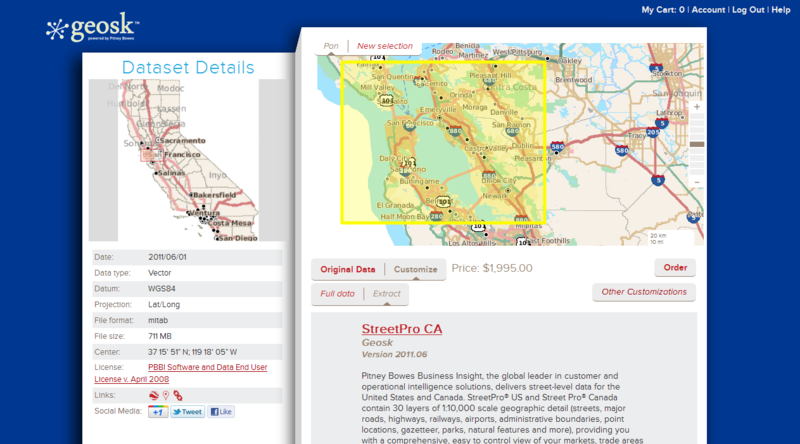 The purchasers of Geosk Library have the added capability to sell their data, just like PBBI does on Geosk. GISVoice: Is the data resident in PBBIs own catalog of data sets more easily accessible than that data that comes from disparate databases? Geosk offers the customer the ability to purchase data through PBBI’s online catalog, or also to use the Geosk platform to manage internal data stored in disparate databases. Using the Geosk platform dramatically enhances the search and accessibility of spatial content, whether the content is internally or externally licensed. GISVoice: What advice can you give people who might be new to PBBI’s data resources and to this service? Our customers tend to use consumer on-demand services every day, services like iTunes, Amazon, Netflix and many others. We’re trying to help the spatial industry become more productive by providing many of the same features and functionality available on these platforms to the analysts in our community. As users of mapping and GIS software, my advice would be to consider being more productive by using Geosk to find, acquire and manage their spatial content, so that they can create better analysis and more efficiently complete their goals.